Braenyn returns to his homeland in Havenwood Forest to confront his mother about the secrets she has been guarding from him his entire life. He threatens to shun all of his people until a dark force invades the forest. An army of killers marches through Elven land leaving nothing but destruction and enslavement in their wake. Braenyn must choose between his rage or family bonds when faces a new evil that will draw him even closer to his true destiny. Join the continuing adventures of Braenyn the elf thief and a world filled with magic, mystery, and adventure in the tradition of dungeons and dragons and the pulp fiction of old. 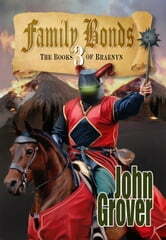 Book 3 of the Books of Braenyn. Each tale is a self-contained story but they will all connect in an over-arching story line. Approximately 5,700 words.